These are the results and conclusions of an in-depth examination on the modifications in the revised book “Krishna, The Supreme Personality of Godhead”, also known as “Krishna-book”. Due to the expensive kind of the examination, only four chapters have been analyzed, viz. the chapters 6, 11, 78 and 88. Modifications 1: Spelling mistakes, commas, punctuation marks. Some of these modifications are justified, some of them are not necessary. However, it would be ridiculous to protest them. Modifications 2: Modifications according to tape recording. These modifications may be justifiable somehow, because the original edition doesn’t follow the tape recording. Well, I can’t say that they ARE justifiable indeed, because personally I wouldn’t dare to face Srila Prabhupada if I revised his books after his disappearance without his unquestionable and direct order to do so, even if all the modifications were completely according to the recordings. There are various considerable facts, NOT to modify the original edition, even if it isn’t completely according to the tape recording, which are discussed later. However, most of this modifications are completely unnecessary anyway, because the meaning remains the same as in the original edition. Modifications 3: Modifications not according to tape recording while the original edition also doesn’t follow the tape recording. Here it is really difficult to understand the mind of the reviser. The original edition very often does not follow the tape recording exactly, because the recording is of bad quality, or the composed sentences need some edition. Mostly the reviser ignores this (otherwise he had to revise practically each sentence of the book), but sometimes, and it is not understandable why, he modifies the original edition, although it is not necessary and his editions too are usually not according to the tape recording (and they can’t be, because of the indistinct sections). Sometimes there are modifications to the meaning. There are some examples below (see “Examples for Modifications 3″). To properly count this kind of modifications is impossible. The number below is the number of the “groups” of this kind of modifications. Such a group usually consists of one, two, three or more modified sentences. Modifications 4: Modifications not according to the tape recording while the original edition follows the tape recording. Minimal effects on the message of a sentence. This are not justifiable modifications. The original edition is correct and it follows exactly the tape recording, but nevertheless the reviser modifies. Usually this modifications seem to be due to make “better” English. All of them are completely unnecessary and the effects on the meaning of the text are minimal. The reviser seems not to like some of Srila Prabhupada’s expressions, and he very often replaces them with his favorites. Sometimes, however, he doesn’t do it. Again there seems to be no system behind this kind of modifications. Modifications 5: Modifications not according to the tape recording while the original edition follows the tape recording. Effects on the meaning of a sentence. This are the ones why many devotees are (rightfully) claiming, that the books have been modified. This are full-fledged modifications. The original edition is exactly according to the tape recording, but the reviser nevertheless modifies the text and changes the message of the sentence too. Examples below. TR: … as there are many minute particles of a spark of the original fire. So these sparks can be covered by the influence of maya, but not the original fire, or Krsna. OE: … they are minute particles or sparks of the supreme fire, but are not the original fire, or Krsna. RE: … they are minute particles or sparks of the original fire. So these sparks can be covered by the influence of maya, but the original fire, Krsna, cannot. TR: …because salvation like this, [indistinct: because?] what to speak of others, who are affectionate to Krsna in the relationship of mother to [indistinct] Krsna with great love and affection for the Supreme Personality of Godhead Krsna who is the Supersoul of every living entity. OE: So what can be said of others, who are affectionate to Krsna in the relationship of mother or father? The pure devotees always serve Krsna with great love and affection, for He is the Supreme Personality of Godhead, the Supersoul of every living entity. RE: So what can be said of those who are affectionate to Krsna in the relationship of mother, who with great love and affection render service to Him, the Supreme Personality of Godhead and the Supersoul of every living entity? TR: In this way, after reaching Vrndavana, the place where everyone lives eternally, very peacefully and happily, they encircled the place by keeping the cars all to[gether]. They began to construct their places of residence. OE: In this way, after reaching Vrndavana, where everyone lives eternally, very peacefully and happily, they encircled Vrndavana and kept the carts all together. RE: In this way, after reaching Vrndavana, where everyone lives eternally, very peacefully and happily, they encircled Vrndavana , drew all the carts together in a half circle, and in this way constructed a temporary [!] residence. TR: Krsna and Balarama, after reaching Vrndavana and seeing the beautiful [indistinct] appearance of Vrndavana, Govardhana on the bank of the river Yamuna, felt very much happy [indistinct: in this way?] this [indistinct: while they're growing?] by Their calves [indistinct] with Their parents and inhabitants of Vrndavana. OE: After seeing the beautiful appearance of Govardhana on the bank of the river Yamuna, they began to construct their places of residence. While those of the same age were walking together and children were talking with their parents, the inhabitants of Vrndavana felt very happy. RE: When Krsna and Balarama saw the beautiful appearance of Vrndavana, Govardhana Hill and the banks of the river Yamuna, They felt very happy. As They grew up They began talking with Their parents and others in childish language, and thus They gave great pleasure to all the inhabitants of Vrndavana. TR: Everyone [indistinct] of Vrndavana felt very much happy, and in the meantime to [indistinct: precisely were] to take care of the calves. The cowherd boys are trained from the very beginning of their childhood to take care of the cows. First responsibility was to take care of the little calves. OE: At this time Krsna and Balarama were given charge of the calves. The first responsibility of the cowherd boys was to take care of the little calves. The boys are trained in this from the very beginning of their childhood. RE: Soon Krsna and Balarama had grown sufficiently to be given charge of the calves. From the very beginning of their childhood, cowherd boys are trained to take care of the cows, and their first responsibility is to take care of the little calves. TR: So Krsna and Balarama were [indistinct: given?] charge of the calves in the [indistinct] in this way Krsna and Balarama along with other little cowherd boys went into the pasturing ground taking charge of the calves [indistinct] playing with playmates. OE: So along with other little cowherd boys, Krsna and Balarama went into the pasturing ground and took charge of the calves and played with Their playmates. RE: So along with the other little cowherd boys, Krsna and Balarama went into the pasturing ground and took charge of the calves, and there They played with Their playmates. All examples are according to the tape recording of chapter 6 and 11 and according to the original edition. The modifications are described in brackets. Text in square brackets has been inserted by the reviser. Similarly, Putana [had] killed so many babies before meeting Krsna [and she mistook Him to be like them] but now she was accepting the snake that would kill her immediately. The modifications are described in brackets. They were full of anxieties, but they could not turn their faces from the vision of Krsna. Some offered Him respectful obeisances, and those who were elderly great sages and brahmanas offered Him blessings by standing up. The Lord’s position is always transcendental, and because He is omnipotent He can act as He likes without being obliged to the material laws and principles. … favors received from Lord Siva are not actually beneficial to the conditioned souls, although apparently such facilities seem opulent. When by the grace of the Lord a devote becomes freed from all designation, his devotional service is actually naiskarmya. … so a devotee’s distressed condition is not the same as the distressed condition of a common karmi. As such, the benedictions derived from demigods are appreciated by the less intelligent class of men. The compassion of Lord Siva was aroused because the demon was offering his flesh into the sacrificial fire. This is natural compassion. Even if a common man sees someone preparing to commit suicide, he will try to save him. In addition, a whole paragraph (The text starting with “The demons are described as duskrtinas, miscreants…”) has been moved and modified although it appears in the original edition at the same place as on the tape recording. We can see that in the revision way more text has been modified NOT according to the tape recording than according to the tape recording. The system of revision is not at all understandable and seem to depend rather on the weather than on any definable principles. Every sane man would consider the revision a step back. Sometimes it is said, that “now we have better understanding”, “we are now advanced Sanskrit scholars” and so on. But this is not true. The truth is that although the devotees in the 60′ and 70′ usually were no “great” Sanskrit scholars and grammarian, they had the better spiritual understanding. They may have not been one of this dried up and proud Sanskrit scholars, but their spiritual understanding was way more nobler than mere material education. This spiritual knowledge is the driving force behind Srila Prabhupadas ISKCON and not some superficial understanding of grammatical rules and etc. And the proof for this better spiritual understanding is if we simply compare the former enthusiastic and expanding ISKCON with the dark and ailing ISKCON nowadays. Additionally this devotees of the 60′ and 70′ realized their direct association with their spiritual master, and didn’t think of him as a “ghost” or a “disembodied being” or that he is “no longer accessible”. The editors of the original editions had the opportunity to ask Srila Prabhupada about certain things, and Srila Prabhupada advised them how to do the editions and the translations. So, how is it possible for a reviser nowadays, barely equipped with the old and hissing tape recordings, some of them missing, with a fire of scandals around him, to do a better job than the original editors? This is ridiculous. Srila Prabhupada used the English language in his very special way and this is one of the things why his followers love him. Someone who doesn’t love Srila Prabhupada, can’t appreciate this, he only sees failures and bad grammar. It is a disaster if one tries to manipulate the chanting of Srila Prabhupada in the name of “better English”. Actually he injures the books and this is a big offense. It is as if someone tries to revise Shakespeare’s works in the name of “modern language” or if he wants to revise the Srimad Bhagavatam in the name of “better Sanskrit”. Once, one of the devotees of Lord Caitanya replaced the word “mukti” with “bhakti” in one verse, and even although it somehow seems to enhance the verse, Lord Caitanya didn’t like it. One word – what to say of a revision! Srila Prabhupada’s books consist of three levels. The first level are the words, the next level is the meaning and the highest level is the transcendental sound or the chanting, the essence of Srila Prabhupada’s books. This is were Srila Prabhupada lives together with Krishna and it is this chanting that makes his books so unique and supernatural. If someone looks into this books, he looks into the face of Srila Prabhupada and Sri Krishna himself. This books are like jewels and we should be very, very careful with this most valuable treasure. It is completely unacceptable to offer this books as a sacrifice to some frustrated empiric pedants. They won’t see the face of Krishna even if there is “better English”. It requires a change of heart and not a change of English. Only about 4 % of the book have been checked and there were no serious modifications to the main philosophy of Krishna-consciousness. The reviser doesn’t put things like “to much devotional service makes you fall down” or “the members of the parampara sometimes engage in all kind of sinful activities” into the mouth of Srila Prabhupada as some may have suspected. There are many modifications to the meaning of a sentence, sometimes serious ones, but the worst modification comes from the heart of the reviser. In the revision it is no longer the humble disciple who serves Srila Prabhupada with his editing ability. The reviser does not want to preserve the teaching of Srila Prabhupada as it is, but tries to enhance the same with his “better English” and his “better understanding of the Bhagavata”. He thinks that he can do a better job than the first editor and even than Srila Prabhupada himself. He thinks that his position is equal and even better than that of the guru. This pride pollution is subtle, but actually it is the worst modification in the book and it is like the poison of the snake that pollutes the whole tub of milk. It is not objectionable if spelling mistakes, obvious errors and missing commas are very carefully corrected. But all other modifications are not needed; there is no need for a revision. The revised editions are not authorized. No true disciple would revise the books of his spiritual master in the way described and demonstrated above; especially not without necessity and without explicit, incontestable and direct order to do so. Srila Prabhupada supports the misguided disciples with all opportunities to humbly correct their errors and prove to be true disciples and no Vaishnava will blame them if they humbly correct their errors – on the contrary! We see that the empiric pedants are not even satisfied with the revised editions of the books, and they’ll never be satisfied. Now they even add “if this is what Prabhupada really said…” to their litany of fault-finding. And the devotees are unhappy with the revisions, even members of ISKCON. This is the wrong way. 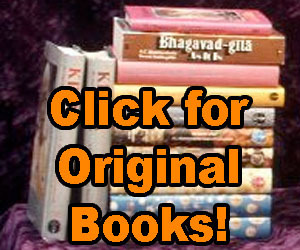 We already have the jewels – the original editions and translations of Srila Prabhupadas books; published, translated and edited under the best possible circumstances, from Vrndavana with love, with the invaluable acknowledgment and benediction of Srila Prabhupada himself. What necessity is there for a revision? Dear Vaishnavas, please accept my humble respects. I have just read this article about changes in the KRSNA Book. Although I am rarely surprised by anything anymore, still I was surprised by the article’s description about the volume of changes to the literature of His Divine Grace A.C. Bhaktivedanta Swami Prabhupada. I have heard all the many excuses over the years for making changes, which from the external perspective may seem logical, but these delusions cannot replace the desire of Srila Prabhupada in this connection. With specific regards to the KRSNA book, during his physical presence, Srila Prabhupada would not even allow so much as a picture to be changed. Why then, when our mundane eyes can no longer perceive him, are so many changes going on? For many years, I was in close contact with Radhaballabha dasa, who was the production manager for producing Srila Prabhupada’s books. A couple of years after Srila Prabhupada’s departure, around 1980, Radhaballabha Prabhu related to me an experience he had with Srila Prabhupada regarding book changes. Soon after the intense marathon for completing the publication of Caitanya Caritamrita, Radhaballabha prabhu approached Srila Prabhupada and mentioned that the artists are now completing the paintings in preparation for the second printing. To this, Srila Prabhupada replied “No changes”. A further attempt was made to explain, stating that there were to be no actual changes, but that the same painting would simply be completed because there was insufficient time during the marathon, and that the paintings were actually published in an unfinished state. Srila Prabhupada replied to him again, “NO changes”. Confused by Srila Prabhupada’s previous responses, Radhaballabha again tried to explain the situation. The short time frame of the publication marathon had prevented the paintings from being completed. They were now to be finished by the artists, re-photographed and in the next printing, the same picture, same size, everything the same except for the finishing touches, would be placed in the exact same spot in the book. Srila Prabhupada now appeared angered and replied again, but this time more forcefully, “NO CHANGES!!!”. They have added a chapter, the 32 to Krishna Book in order to have the Chapter ” Description of dance rasa ” in the number 33, a very special number for freemasons.